LSM-9000 Series are fully automatic 2D-measuring devices which measure retardation values and the direction of a slow axis in a transparent body having strain and exhibiting birefringence. The Fullauto StrainEye makes it possible to start measuring immediately by only putting a sample on the polarizer. Retardation values and the direction of the slow axis can be measured easily. Since the direction of retardation and a slow axis are 2D-displayed on a monitor, those direction states are recognized immediately by the operator. 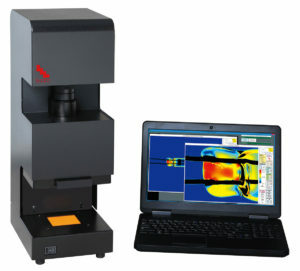 This device is connected with a PC, and it is simple to save not only the scan data, images, 3d images and numerical data. With the free viewer software additional technicians can review the scans on their own pcs. 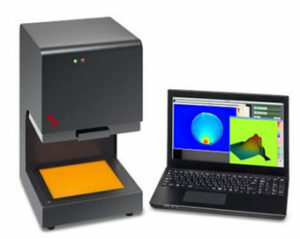 The software allows for additional analysis including setting limits on results and a 3d visualizer that lets you see the data as a 3d model that you can rotates in all directions. With the use of super-luminescent LED as a light source, this detector is designed for long life and low power consumption. The sample size can vary from 10mm x 10mm to 60mm x 60mm based on being equipped with x6 magnification optical zoom lens for taking images. The LSM-9000 LE has a larger view area that can accommodate samples that are up to 175x mm x 175mm.